David Bruckner’s The Ritual is a lot of things, a straightforward horror film is not one of them. Everything points towards this film being a traditional horror, the eerie black and red advertising campaign, the remote forest setting, even the set release date of Friday October 13th all seem to promise we are in for an hour and a half of scares. It soon becomes clear that we have been misled. While we do get some scares along the way, these do not seem to be the point of this film. Here we encounter the key downfall of an otherwise decent movie, it never seems to make it’s point. The characters never to reach their goals, emotional or physical, and there is little to be said for any worthwhile development of those goals through the film. This is not done in a way that appears to be artistically existential or to subvert mainstream horror standards. The lack of clarity in the point and lack of emotional investment in this film unfortunately stems from the filmmakers having a good premise and a good actor, and relying on these two to distract the audience from the lack of depth in the rest of the film. The Ritual begins with a promising if conventional set-up: a group of 30-something men, best friends are planning a “lads holiday” down at the pub. On the way home Rob (played shortly but sweetly by Irish actor Paul Reid), who has been established as the most sensible and kind-hearted of the group is caught amidst a violent robbery and brutally murdered while Luke (Rafe Spall) cowers in the corner. Flash forward six months and the four remaining friends are fulfilling Rob’s wish to take a hiking trip in Sweden. All seems to be going well until the inevitable “shortcut” off the beaten path and through the imposing black woods. After a series of unnerving events it becomes clear that the friends are being psychologically terrorised by something or someone in the woods. They are subjected to crippling nightmares that bring to life their worst fears. Luke is forced to relive the night he watched Rob die every time he falls asleep. Here the film moves well between emotionally grounded psychological horror and the realistic presentation of how each friend deals with or indeed denies what is happening. As the supernatural elements become more and more prominent the film begins to spiral. We move between the deteriorating friendships to Blair Witch-style tree markings to suggestions of human involvement to a monster in the woods. The monster thread in this ever expanding tapestry is the cause of the film’s ultimate unravelling. It is almost impossible to maintain the fear in a horror film once we see the monster. Smoke and mirrors are always more effective than the beast in its entirety because nothing will be scarier than what the audience imagines. The CGI or the prosthetics more often than not disrupt any suspension of disbelief thus undermining the entire reason you went to see a supernatural horror film in the first place. Although The Ritual reveals too much of it’s monster to hold its audience on the edge of their seat, it does remain a decent film. The first half in particular is creative and self aware, jump scares aplenty are rooted in the mundane, forcing us to laugh at how willing we are to be frightened. Downton Abbey’s Robert James-Collier proves his acting chops can hold their own outside the distractions of set and costume. 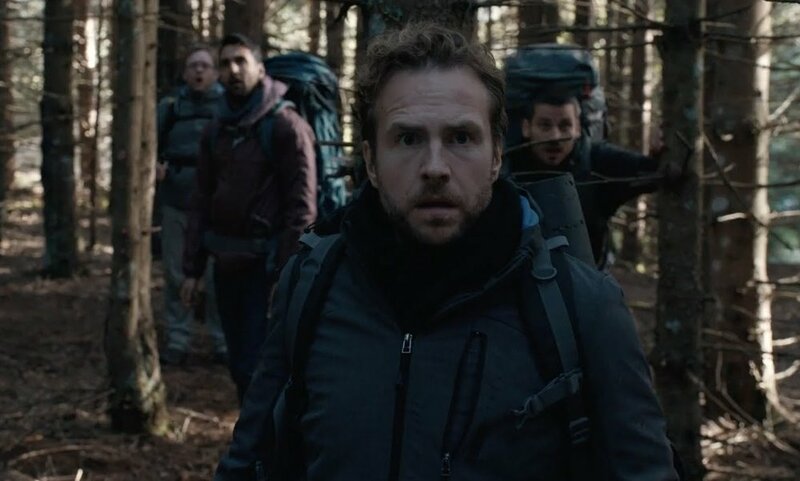 Rafe Spall leads the pack admirably, thankfully having by-passed his father’s looks to inherit solely his talent for subtle and nuanced performance. Appreciation of The Ritual is fleeting, you won’t leave the cinema thinking about it’s meaning or be given nightmares by its story. It can be described as a decent but essentially forgettable foray into the horror genre.